Vietnam : March 13 - April 13 : Hoi An - wonderpaars jimdo page! I had hoped that our bus ride out of Kon Tum would be nothing like our ride getting into Kon Tum. My stomach had settled since that day, so I assumed we would be trouble free. We had not bought the tickets the day before, so when we said bus station to the driver, he took us to the private bus station of the company he worked for. Unwilling to make the situation more difficult, I bought the tickets. They were the last two seats in a minivan that was not made for 12 people, so I tried to get the seats with more leg room. The driver sad we could change if I paid him a few dollars more. Outraged, not at the dollars but at the principle, I marched to the ticket booth. Communication was difficult here and the whole thing escalated into a bigger problem than was needed. At one point I had the receptionist at our hotel on the phone, acting as translator. Long story short, we were refunded most of our money and climbed into a privately owned mini van with a bit more room. It would stop more often, but it was worth it. The ride through the highlands was breathtaking - it was some of the most beautiful landscapes we had seen in Vietnam. Green and lush, with rolling hills and farmlands. We often saw groups of children milling about the streets or teenagers walking home from school. It was unspoilt and beaming with life. We realized too how infrequently our driver honked. You see, in Vietnam, you drive with your fist on the horn. At every curve, angle, house, bus stop, tree - you honk. And you honk loudly. Some cars have a more pleasant sounding horn than others, but even then the noise cuts right to your nerves. We realized how quiet our ride had been and realized how pleasant that had made the whole journey. 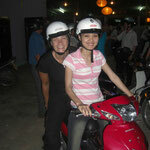 After 5 1/2 hours we arrived in Danang and knew we would need to find a bus to Hoi An. The touts were already outside of the bus station waiting for us, but our kind driver knew where we were headed and almost passed us off to the next bus. Moments later, after a quick pee break, we were sitting in the front seat of a local bus. We wondered why the travel books said that the local buses take almost 2 hours to drive 38km - and as the bus stopped every 5 meters, we wondered no more. The bus became so full, I didn't dare to look behind me. At one point, the bus boy threw a stack of cone hats on Patrick's lap, through the window - they take up too much space in the cabin, so the ladies take them off for the ride. It was on this bus that we met Kien - a young man who would become one of the kindest people we met in Vietnam. Sceptical at first that he was trying to sell us something, that scepticism melted away immediately and we spent the next hour asking all the questions we could think of. He asked where we were staying and when I gave him the name of the place I had chosen, he said "Oh, my girlfriend Phi works there." How improbable I thought. At the bus station we said our goodbyes and figured that may have been the last of it. We did not have a reservation, so when I walked into the Thanh Xuan (Long Life) Hotel and asked the beautiful girl at the door if she was Phi and she answered yes, I knew this would be a special place. Hoi An, aside from its charming streets, lantern making and overall delightful atmosphere, is known for one thing: tailor shops. Some people arrive at this mecca of custom made clothes not knowing about the opportunities, but we had come forewarned. And we had even planned, with pictures, ideas and a budget of what we would allow ourselves to spend. And we were here on my birthday, so it was not so difficult to say "Yes" to a 3rd pair of pants and yet another white blouse. The shops lined most of Old Town - one after the other, with little difference between them. The mannequins are all dressed in some kind of outfit that is supposed to resonate with foreigners and beyond them, the shops are lined with bolts upon bolt of fabric and books for inspiration. We had allowed ourselves enough time to look, compare, look some more and then do some trial pieces. And from there, the beast took control. For days, we created, tried on, ordered and picked up our creations. We splurged at the high end store like Yali, but mostly used the lesser known tailors on the side streets. With patience and time, the end product was just as well done. We would come home with tailored boots, shoes, pants, blouses, dresses, suits, shirts and even a hand-bag. Most pieces were a complete success, only a few were absolute misses. At the end of the week, with 20kg extra, we realized that we would indeed need to send another package home - there was no other way. We took one field trip to the ruins at My Son. Though not comparable to anything we saw in Cambodia, these ruins were worth a visit because they were once said to be the spiritual center of the Cham kingdom. The short bus ride there wound through rice paddies and local villages, giving us yet another opportunity to view a little slice of life. At the ruins, we were welcomed with a traditional dance performance. The young women were clad as apsaras and performed the kind of dance that might have been given to the king or other nobility. 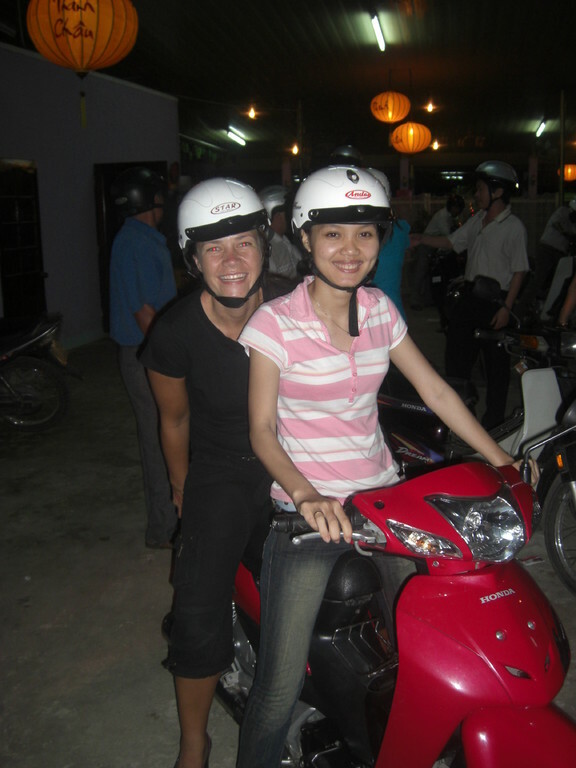 At the actual ruins, we ventured away from the guide and followed the descriptions in our Vietnam book. With a bit of humor and giddiness, we explored the stones in between relaxing in the shade. The most devastating part of My Son is that most of it was destroyed during the Vietnam War, by US fighter planes. The US believed that Vietcong were hiding here (which was never proven) and targeted the area heavily with bombing and fire power. They demolished towers and the bomb craters are a reminder of this poor decision. Supposedly, it was a French archaeologist who criticized the US for destroying this historically significant area and called for a seize fire on such sites. This moved President Nixon to order a halt on attacks to historic sites. On our bus trip back to Hoi An, Patrick and I had one of those conversations that changes things - that opens doors, creates excitement and enlivens the heart. Those unexpected moments, in unexpected places were part of the magic of this journey together. Aside from the shopping, walking around the old town of Hoi An is a joy. Buildings have been restored and reflect an old world charm that hard to find. Hoi An is known for its lantern making and in the evening the stalls come alive with color and light. It was one of my favorite sites on our travels - watching the lanterns turn on all over town. The riverfront and the local market are also places to catch a glimpse of local flavor, away from the draw of the tailoring shops. One night we enjoyed a delightful dinner at a restaurant across the river. Later in the week, we had an even better dinner with Kien and Phi, who picked us up on scooters and motoed us to a local place would have never found on our own. 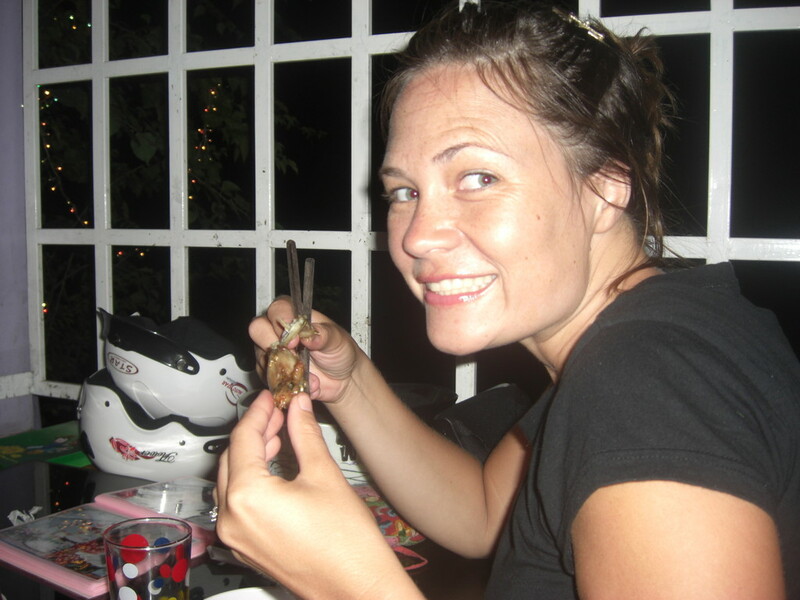 We dined on local specialities, including frog's legs. Delicious! We enjoyed a bike ride in the morning to the covered bridge and other side streets. We rode as the streets were coming alive in the morning and it was charming to see the locals enjoying coffee and pho at the edge of the road - little plastic seats and tables were brought out and friends ate together before starting their days activities. With lantern making classes, cooking classes and bikes to rent on every corner, this could be a place to stay for while.